As the new foreman of the Smoke River Ranch, Gene Autry must deal with a group of girls from a swank eastern school because his boss, Mrs. Forbes, is trying to make ends meet by running the place as a dude ranch. One of the girls, spoiled and precocious Connie Lane, is forced by her father to go to the ranch, so she decides to make life miserable for her schoolmates, her hosts, and her teacher, pretty Alice Bennett. Her escapades include staying on the train when it leaves the Smoke River station, trying to take a high jump on a horse not trained as a jumper, sending her father letters accusing her hosts of mistreating her complete with staged photographs, and attempting to run away from the ranch in a truck with faulty brakes. Gene rescues her just before she wrecks the truck on a curve, and then gives her a sound lecture on sportsmanship and fair play, which makes a considerable impression upon her. Now thoroughly on Gene's side, she tries to help him win a bronc-busting wager with Happy Callahan, the former foreman, by cutting the cinch on Callahan's saddle. A misunderstanding results, leaving Callahan with rancor in his heart. At the same time, Connie's father arrives at the ranch, vowing to "rescue" his daughter from her ill treatment. Frog Millhouse and Tadpole extend Mr. Lane's stay by rigging his plane. Soon, though, he comes under the spell of Gene's forthright honesty and good sportsmanship. 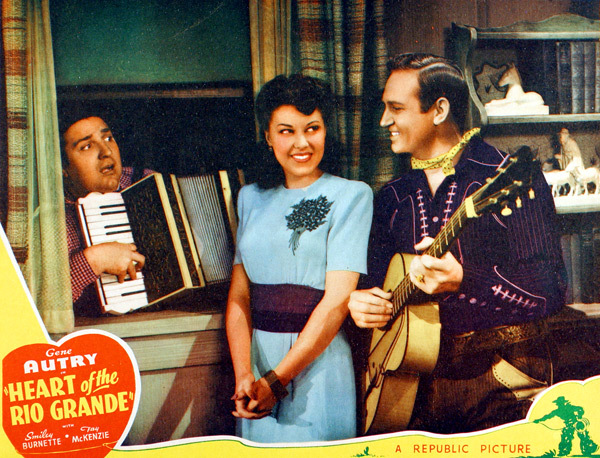 During a round up, Callahan, attempting to kill Gene, sets off a small avalanche. Gene rescues Connie, her father resolves to be a better parent, and all is well at the ranch. Tadpole Millhouse Joseph Strauch, Jr. 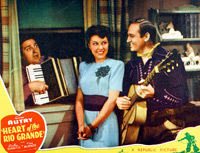 DEEP IN THE HEART OF TEXAS Gene Autry, Smiley Burnette, Extras and Joe Stauch, Jr.